There are many misunderstandings and misconceptions when it comes to choosing the right pair of fins for you. 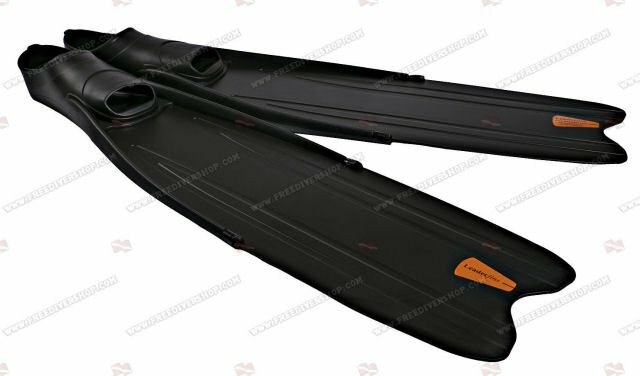 This article will try and shed some light on the subject of what makes Freediving & Spearfishing fins different from other type of fins and how to choose the best pair of fins for you. The first and most noticeable characteristic of freediving & spearfishing fins is the length of the fin's blade. Many people think that freediving & spearfishing fins are so long so the diver can move more quickly underwater - although this may be true, these fins will propel you quite quickly, that is not the main reason they are so long. The reason freediving & spearfishing fins are long has to do with the structure of the fin's blade. The fin blade is actually linearly graded, this means that the fin blade much thicker / harder at one end (close to the footpocket) than the other (at the outer edge of the blade). Such a graded fin blade structure creates an energetic "leaver" that makes propulsion underwater very efficient. In other words, the ratio between the energy the diver must put into moving the fin underwater to the actual resulting propulsion is larger than in any other type of fins as a result. Think of it this way; a normal snorkeling / diving fin requires the diver to generate X amount of energy to receive Y amount of propulsion. With a freediving & spearfishing fin it takes 3Xs of energy (the fin is longer and has more resistance when moving in the water) to get 5Ys of propulsion. In conclusion - less energy for more propulsion - when it comes to breath hold diving, efficiency is everything. This is the most common type of fins around. The fin blades are made of polymer (plastic). Advantages: Low price - but get the job done! Great for beginners or for divers who don't want or can't invest in more advanced fins. Disadvantages: Polymer fin blades are graded differently than Carbon or Fiberglass blades - using "ribs" to create a gradual effect. Although this still gets the job done, they are not as efficient as Carbon or Fiberglass blades. In addition, Polymer is a material that has "memory". If a polymer blade is bent enough times it will start shaping to the curvature of the bend - rendering the fin even less efficient over time. AKA "Hybrid Fins". These fins are extremely durable and are a great choice for spearfishing and freediving alike. Advantages: Linearly graded fiberglass blades. More efficient than polymer fins. Extremely durable - this kind of blade can sustain impact with rocks underwater without breaking. No "memory" - the blade will remain completely straight throughout the life of the fins. 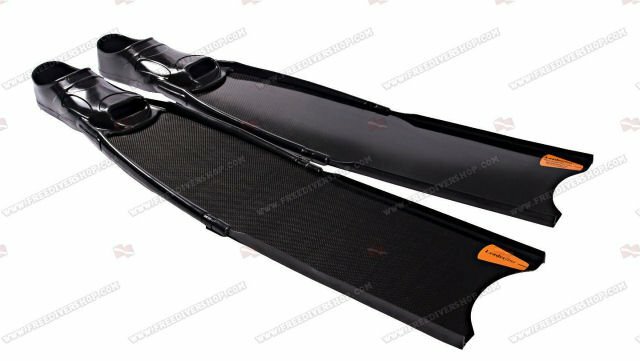 Disadvantages: A bit more expensive than polymer fins, however choosing a fiberglass fin is definitely a worthwhile investment. The premium class for freediving & spearfishing fins. The fin blades are made of 100% pure carbon. Advantages: Linearly graded 100% pure carbon blades. Extremely efficient - greatest ratio between energy and propulsion from all freediving & spearfishing fins classes. Lightweight and completely memory free guaranteeing a straight blade throughout the life of the fins. Disadvantages: More brittle than Fiberglass however still extremely durable. "Expensive fins don't make a good diver"
Investing your money in the most expensive fins - doesn't make you a better diver. a good technique is what makes for a better, more efficient diver. This doesn't mean that there is no difference between the different fins classes underwater, but a diver with poor technique will not benefit from the advantages of a more advanced fin. "It's hard to swim with the fins on the surface"
Looking for a pair of fins that is both easy to use on the surface AND efficient underwater is useless. 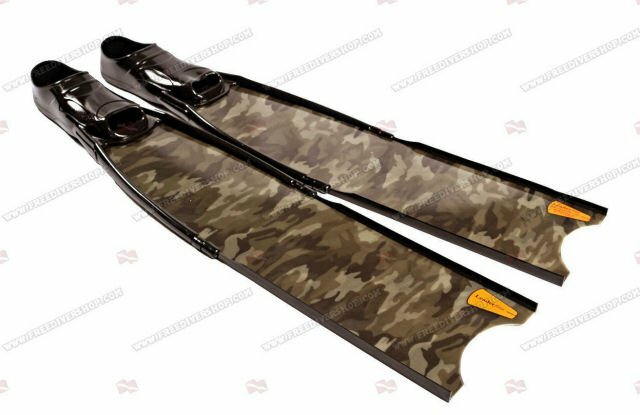 Freediving & spearfishing fins are not designed for surface swimming. They are designed to perform best while completely submerged underwater. "Greater depth requires a stiffer fin"
Freediving & spearfishing fins come in a variety of stiffness levels. 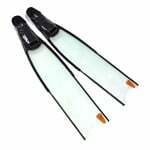 Many divers think that for a deeper dive they will need a stiffer pair of fins - this is a very common mistake. 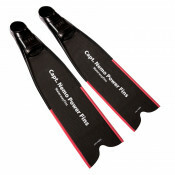 The stiffness of the fin blades has nothing to do with the maximum depth. The stiffness should be relative to the musculature of the diver; A lean diver or a diver who has elongated leg musculature generates weaker energy impulses with every stroke than a diver who has very bulky and short musculature and therefore will require a softer fin. 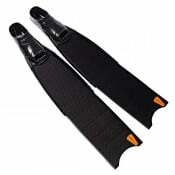 With proper technique - most divers will perform best with medium-soft or medium stiffness blades.